Kerma ski poles are a subsidiary of Rossignol, which is one of the major players in the ski manufacturing industry. Kerma designs all-mountain and racing ski poles for men, women and juniors. Although the pole construction may vary, Kerma specializes in lightweight, composite ski poles. What are Composite Ski Poles? Throughout most of the 20th century, ski poles were made of aluminum. In fact, many still are. Aluminum is sturdy and cost effective. However, in the past decade, ski gear manufacturers have been experimenting with a new type of pole, which is made from a variety of materials. Composites can be made from a variety of materials, such as graphite, carbon and glass fiber. Typical material combinations might be 90 percent carbon and 10 percent glass fiber, or 60 percent carbon and 40 percent glass fiber. Due to their light swing weight, these poles quickly became popular. Swing weight is defined by the amount of energy a skier requires to swing the poles on various types of terrain. It is determined by a combination of body weight and personal strength. The strength to weight ration of a composite pole can be six times greater than the swing weight ration of aluminum poles. Choosing the correct swing weight of a ski pole enhances technique. For example, choosing a ski pole with a heavy swing weight requires excessive tension, which can can deplete your energy. In contrast, poles that have a light swing weight might be overpowered by a stronger skier. 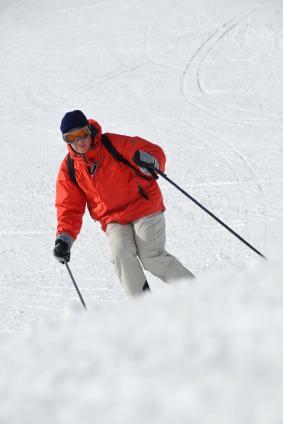 However, newer skiers, who are less knowledgeable about ski pole technique, often prefer a somewhat lighter swing weight. This keeps them from developing excessive tension during the learning process. Kerma Scorpion Composite ski poles have a diameter of 13.5 millimeters. They are composed of 20 percent carbon and 80 percent fiberglass. The pole shaft features the attractive, black and silver Scorpion logo. Since most women are shorter, and have smaller hands than men, Kerma has designed female-specific ski poles. The Kerma Exclusive women's ski poles have a tapered shape, which reduces its swing weight. The grip or handle is ergonomically designed for the female hand. The shaft has an attractive red and white design. For the budget minded, Kerma has two types of aluminum ski poles; the Kerma Vector Aluminum, and the Kerma Vector Black Aluminum. The Kerma Vector Black Aluminum has an 18 millimeter diameter. The grip is ergonomically designed for ski racing, and the shaft is black with silver lettering. There are two minor differences between the Kerma Vector Aluminum and the Kerma Vector Black Aluminum: color and grip style. The Kerma Vector Aluminum has a blue or silver, as opposed to a black shaft; and the grip is designed for recreational skiers, as opposed to ski racers. Choosing the proper kid's ski pole is important to the learning process. Even taller children may still have child-sized hands, so it's usually important to choose a junior, as opposed to an adult-sized, ski pole. Kerma Vector Junior ski poles have a 14 inch diameter. The grip is designed for a child's hands. These poles use an alloy construction material and have a steel tip. They are available in blue or red. If you want to buy Kerma ski poles online, there are a number of places where they can be purchased. Occasionally they can be found on Ebay, or on the classified sections of various ski forums.